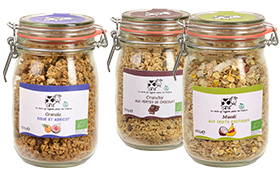 Our range of organic cereals La vache qui regarde passer les trains is presented in a jar with a mecanic opening. This kind of jar can be used to conserve other products (dry vegetable or pasta for examples). It preserves the quality of cereals too. Its big capacity is a strong asset, the packaging is elegant and old school. Organic cereals La vche qui regarde passer les trains are preservatives free and 100% natural. Discover all the range of our organic cereals : crunchy with red berries, crunchy with chocolate chip, muesli with exotic fruits, granola with fig and apricot. Products exclusively distributed by SDP Rungis in France.